KISSlicer is a commercial product, but the free version let you print single object with most of the options available. As you can discover in the Reprap magazine, there is no one solution to the slicing problem. It’s an optimization task and each program is solving the paths differently. Each of these package offers different options to reduce problems like strings / seams on the edges and increase overall printing quality. In the previous picture you can see how KISSlicer is splitting this “gear”. The path colors on the right represent the type of extrusion the printer will do. Like you want to have a lower speed and more precision for the output shell, but for the inner shells, the printer can go faster. As I was looking at the subject I found these vase pictures from 3DPrinterGear user on KISSlicer forum where you can see that depending on the printing mode, you can end-up with a very visible seam on one side, or more like a “chicken-pox” effect when the slicer starts each profile at a different point each time. The ‘obvious’ solution was to extrude the plastic in one path, think of it as a spiral and avoid completely the issue. I found later that Cura slicer has an option called “Joris mode” to exactly do that for single wall objects. That seems like an interesting challenge to take and see how hard it would be to build a slicer and generate some G-code to print a continuous extrusion profile. As this is only considering the outer shell profiles it’s a nice subset to experiment and develop algorithm for. So let’s dig in the slicer, algorithm! 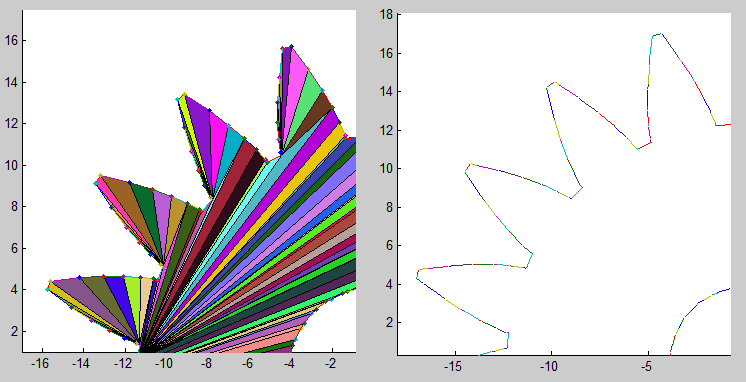 Note: all the graph on this post are generated using Matlab. The code is available at the end of the post. The gear shape is coming from this thing on Thingiverse made by Emmett. The first step once the tessellation is read is to find for each Z plan the section of the geometry. The geometry of a STL file is a tessellation of triangles in space. So the brute force method to do it is to test if each triangle is intersecting the current plan. This is obviously not optimal and we have to weed out most of the candidates otherwise we’ll spend ages processing the file. Let’s simplify the problem and display it in 2 dimensions (only X and Z), now for each triangle we can find the lower Z vertex and the higher Z vertex. Example in triangle A the lower is at Z=2 and the higher Z=13. Then we have to sort all the minimum and the maximum in 2 lists of increasing Z values. => the answer is only triangle [A D B] have to be tested for the section. For a real implementation you would keep the list from one Z plane to the next and the location in the list were your stopped the search because triangle that are already under will never be used again. Also to keep the R/W low it’s probably more efficient to use a linked list in C.
For each of the intersecting triangle we have to check how many vertex are already in the plan as no extra computation are required in this case. And here are example of the result for the gear section. 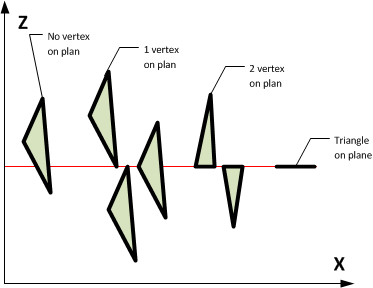 The left picture is the bottom plan of the object so all the faces are in the plan and displayed as triangles of various colors. The right picture is a plane over were all the intersecting faces are represented as segment. That’s all for today, the graph are generated using this Matlab package, and all code are copyrighted, only usable for non-commercial purpose and provided as is with no guaranty of any sort! The package includes a Matlab STL reader that can open TXT and binary files. This entry was posted in 3D printer, Slicer, STL files and tagged 3d printing, matlab, slicer, stl files on April 24, 2013 by damienideas. I interested 3d printer so i study your matlab code. how i show bottom face? How can i show this picture? if you look inside the main file (startSlicer.m), there is a loop where all the triangles are intersected with the current slice plan. When the triangle is inside the plan, its intersection is the triangle itself. The triangle are displayed with “Fill” function. But remember that to see any triangle, the faces have to be in the XY plan (normal to Z) and the slice Z has to be the same as the face. I think gcode have a key but ican’t understand now..
I’m not sure I understand what you want, maybe you could describe your goal/what you want to achieve?